Children and young people with disabilities often do not meet recommendations on physical activity and this deprives them of the health benefits of exercise. 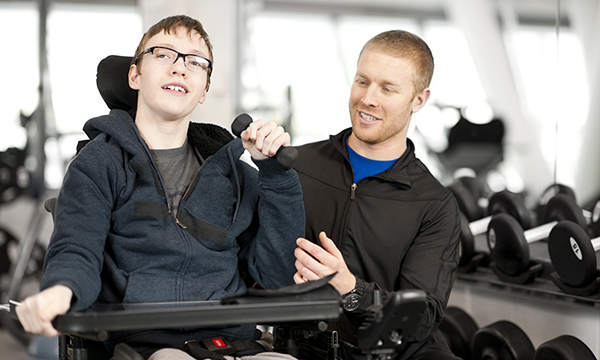 This study compares clinicians and young people’s views on facilitators and barriers to participating in physical activity for people with physical disabilities. All participants were recruited through Novita's ConnectABILITY, a non-government referral-based programme in Australia which aims to enhance participation in physical activity for children and young people with disabilities. Clinicians were recruited using snowball sampling and semi-structured face-to-face interviews were used to gather their opinions. Children and young people enrolled in the programme (n=125) aged ten to 17 years were sent information packs including the survey addressing facilitators and barriers to physical activity. Completed and returned surveys implied consent to participate in the study. Six clinicians (four women and two men), with two to 20 years’ work experience with Novita, were interviewed. Of the surveys from children and young people, 28 were returned (12 girls, 16 boys). Clinicians identified five facilitators and seven barriers, while children and young people identified three facilitators and four barriers. Both identified the need for appropriate adapted physical activities and pathways to develop skills. Clinicians felt family commitment and support was important while children and young people reported that the ‘right people make physical activity fun’. Absence of adapted physical activities, limited knowledge of the benefits of physical activity, providers not understanding a condition, and physical limitations were perceived barriers to participation. The authors conclude that commitment can be a facilitator while its absence can be a barrier. This article further identified the need for adapted physical activities which provide opportunity for development, and the need to discuss the benefit of physical activity with families to achieve a shift in behaviour. Limitations of this study are the inclusion of clinicians working with the Novita programme. However, as the range of clinicians was wide and included physiotherapists, occupational therapists and sports officers, a wide range of perceptions was covered. There were a limited number of survey responses from children and the fact that they were already enrolled on the programme and identified themselves as physically active might have introduced bias in the responses. Despite its limitations, findings of this article are supported by the literature and are consistent with barriers and facilitators cited by professionals working with children and young people with and without disabilities (Bloemen et al 2014, Lauruschkus et al 2015). Nurses are ideally placed to engage families in a range of settings such as the hospital, community or schools. They can gain parents’ commitment by highlighting the benefits of physical activity. In the adult population, the End PJ Paralysis campaign is an example where nurses are already involved in encouraging patients' activity in an effort to improve health, well-being and to aid recovery. While it might be difficult to find adapted sports for children with disabilities, collaboration between nurses, allied health professionals and local sports providers could help to share information about existing opportunities. For children with disabilities who generally participate less than their healthy peers, engagement in physical activity is even more important as it can prevent some secondary impairments as well as combatting mental health problems and slowing down deterioration (Carlon 2013). Nurses have an integral part to play, and if we all start talking about physical activity and pull our efforts together to engage children and young people in physical activity, we have the potential to increase families’ commitment and enhance engagement and participation. Bloemen M, Backx F, Takken T, et al (2014) Factors associated with physical activity in children and adolescents with a physical disability: a systematic review. Developmental Medicine and Child Neurology. 57, 137-148. Carlon S, Taylor N, Dodd K et al (2013) Differences in habitual physical activity levels of young people with cerebral palsy and their typically developing peers: a systematic review. Disability and Rehabilitation. 35, 8, 647–655. Lauruschkus K, Nordmark E, Halstrom I (2015) 'It’s fun, but…' Children with cerebral palsy and their experiences of participation in physical activities. Disability and Rehabilitation. 37, 4, 283–289.